Or "How tikey abused his regular status to post outside the promotion forum"
Just joking, this is not promotion. Just as an excercise I’ve been designing a boardgame. I’ve been doing it on and off for a while and now I’m getting close to a point that I’m comfortable talking about it. A few playtests more and I even might even try to get some of you to play in a few months. 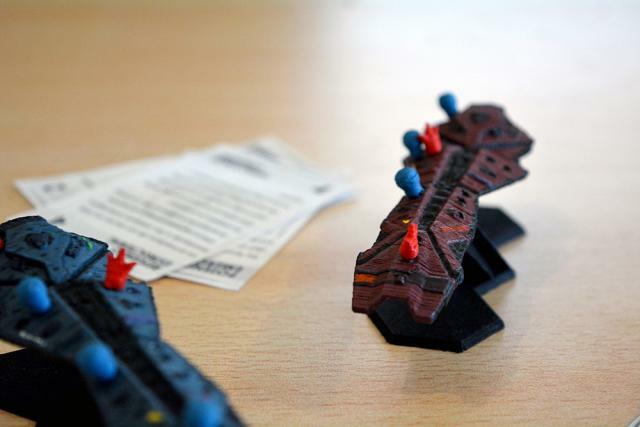 Galactic Battlecruisers is a game of capital spaceship combat. The objective is to disable the enemy ship or at least cause the maximum amount of damage before running out of energy. 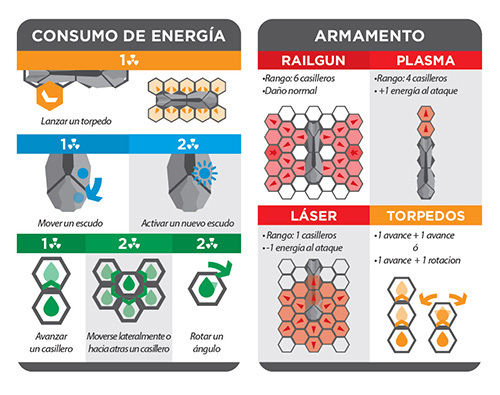 Each player gets a ship that’s divided into six subsystems, and a hand of six “energy” cards. During play they use the energy to perform different actions like advancing, rotating, attacking, launch a torpedo or activate shields. Each of those actions have a energy cost. Each subsystem can withstand two hits, once it receives a second point of damage it’s considered destroyed. A player achieves victory once he destroys three of the six subsystems or causes seven points of damage overall. Besides being used for issuing orders cards have a value attached to them that’s used to resolve an attack. The attacking player after declaring his action chooses one of his cards and places it face down. The defending player can use one card from his hand or the card that’s on top of the deck in order to defend. The card with the highest value is successful (in case of a tie the result favours the attacker). 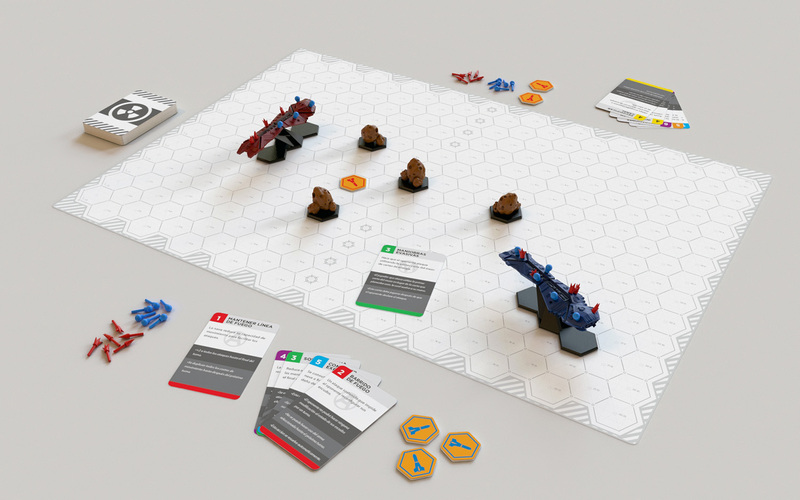 Cards also have special abilities tied to them, so a card might allow a player to destroy a torpedo or to perform a “jump” and relocate his ship to another part of the board. I’m now finishing a preeliminary rulebook which I’ll post later. It’s still a long way to go but I think I’ve finally nailed the core mechanics. Now it’s onto balance and to find ways to spice things up. It’s been quite fun to design a board game and at the same time I’m amazed at how much it overlaps with industrial design so the process flowed quite naturally but it’s much more dependant on “user testing” as the interactions between systems are much more complex. I’m looking for opinions and maybe interested people to e̶x̶p̶l̶o̶i̶t̶ help me test and go over the rules. You should, it’s fun and it’s something you can mule over while travelling or doing some other stuff. The good thing about Board Game design is that it’s cheap you don’t need much more than sissors and paper. Well, if someone is interested I’ve got the preliminary rules. I’d love if people can take a look at them and tell me if they’re an indecipherable mess or if they’re ok.
Also I’m finishing the last touches on a tabletopia version for testing and I’d love to have some v̶i̶c̶t̶i̶m̶s̶ volunteers. You ever consider taking it to a gaming convention or something like that for play testing? Sorry, it’s just the minis, they look like Higaaran cruisers. I’m looking into the local boardgame communities. Sadly I don’t know any conventions happening around here. Actually the first placeholder I used for the ships was a Hiigaran Battlecruiser from HW2. I even 3D printed some minis for playtests. I’ll sell the concept to Gearbox later for a custom version. “GALACTIC BATTLECRUISERS” - Good! Good luck! This reminds of back in the day, a Starcraft 2 Custom map. I’m blanking on the name, but the basic premise was that you and your fellow players were controlling subsystems on a battlecruiser, vs. an opposing team with similar setups. You gathered resources, etc. It might be worth looking into for inspiration.